← As always, Sebastian wants to come too. Many of you know that I’ve always wanted to write a book. And by ‘write a book’, I do actually mean ‘publish or finish one of the five or so I’ve started over the years.’ Lofty goal, certainly, and I have as many excuses for why I haven’t yet accomplished this as I do former crushes. But today – well, actually, on August 26th when it officially came out – everything has changed. I’m published. In a book. A HARDCOVER book. A hilarious and funny and witty and amazing and "OMG I couldn’t be prouder to be in this masterpiece" book. 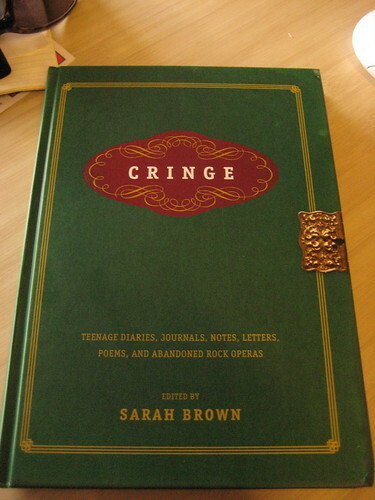 My friend Sarah Brown (who yes, I have known for nearly SEVEN years through the magical power of the Internets) started this event called Cringe in NYC where people went to a local coffee shop, stood up and read their most embarrassing journal and diary entries. It’s been a hit for years, and she got a book deal out of it. So when she called for entries (and it happened to coincide with my Mom discovering a whole box of notes I had written from Middle School & subsequently sending them on to me) it was like shooting fish in a pre-pubescent, overly hormonal-fueled barrel. 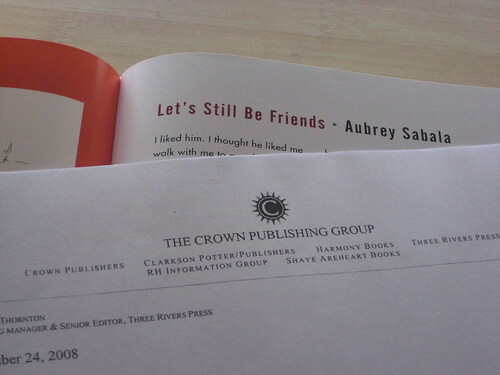 I sent on two of the best ones, and alas, one that we’ve titled "Let’s Still Be Friends" made the cut. I won’t go into the ensuing hilarity that included me having to track down Nick, the author of the note (it was sent TO me) but it involved one of my more awkward stalking-on-MySpace moments ever and an email that began with "Hey Nick, it’s Aubrey – remember, from Middle School? So we haven’t talked in, uh, twenty years, but I have the funniest question for you…" You know, just one of those emails you get every day. I’m so beyond honored to be in this book wish such great, amazing, hilarious writers – besides Sarah of QueSeraSera fame, Heather Armstrong (Dooce), Maggie Mason (MightyGirl/MightyGoods/MightyJunior), Joshua Newman (Self-Aggrandizement), Alice Bradley (Finslippy), Greg Howard (GeeseAplenty), and Ariel Meadow-Stallings (Electrolicious) are just a few of the other contributors, and I’m proud to call many of them my friends. Anyway, my copy of the book just arrived today, in the midst of a chaotic and crazy and busy and stressful week (I leave for Europe tomorrow – aak!) and instantly, the swirling thoughts in my head and the to-do lists and everything else was replaced by me jumping around the office in hysterics. So if you’ll excuse me, I now have some freaking-the-hell out to do. Aubs, congrats 🙂 I want. congrats honey!! the first of many published works, no doubt. can’t wait to see it IRL! wahoo! Congratulations! You are smart, funny, and talented and this accomplishment PROVES it. Love you. Congrats. You rock. Can’t WAIT to buy the book. congratulations, aubrey! I’m sure this is only the beginning of your words being captured by the binding! I can just imagine how thrilled you must be. Will certainly check out the book. Congratulationes! Can’t wait to read it! yay! congrats. You need to come back to atlanta to celebrate. Maybe on your book tour. Nice blog…..been reading a few post. Just discovered your blog, read the first post and had to say, Congratulations. Writing a book- getting published, a dream of mine too. Although clearly I have never gotten as far as you did. That is fantastic!! I’ll be here often. Love the blog! Congrats! I am looking forward to reading it. Congratulations!!! You should be very, very proud of yourself – that’s awesome!